Whenever a new version is released, it is tested with the latest operating systems and usually bundled components are updated to the latest versions As always there will be a detailed list of all supported platforms and exact versions will be published on our website. This blog posting is a bit more informal and talks about what I think are interesting on the list. Some of this is my opinions on the various supported platforms and some of the pros and cons. We now have added support for Chrome, Firefox and Safari. We support IE 9 everywhere and are testing on IE 10 (need a released version before we can give a final say). We support IE 8 for Sage CRM and Quotes to Orders, but we don’t support IE 8 for the Web Portal in Sage 300 ERP. We continue to support Windows XP at the SP3 level. Beware that Microsoft is currently scheduled to discontinue this support on April 8, 2014. They have extended this deadline several times already, so stay tuned. This will be dangerous since they say they will stop issuing security updates at this point. From our own surveys we know we have a large number of users still running on XP and that people may not want to have to buy new computers until absolutely necessary. The worst thing about XP is that Microsoft doesn’t support IE 9 there and that IE8 is quite slow and buggy. The big benefit for Sage 300 ERP users is that now that we support the Chrome, Firefox and Safari browsers, that is, you don’t need to use IE 8 anymore for our products. We highly recommend that you install Firefox or Chrome (you can still use IE for other things like SharePoint if you need it). In fact the Sage 300 Web Portal no longer supports IE 8 so you will need to use one of these browsers to access it. For Sage CRM (and the Quotes to Orders function), we still support IE 8. As another note, we don’t support using Windows XP as a web server for either Sage CRM or for the Web Portal in Sage 300 ERP. If you need a web server running Windows 7 works great or use a true server version of Windows. This is the main client platform we support. Sage 300 ERP runs best here and we highly recommend using this client operating system. We support the 64-Bit version equally to the 32-Bit version. In fact we recommend the 64-Bit version since this is the only way to take advantage of the memory in any newer computer. We are running our automated tests against the release previews of these products. We can’t officially support these until we can test against the released versions, but we are hoping that if the released version doesn’t spring a major surprise, then we can support these very quickly after their release. Note that for Windows RT (the ARM processor version of Windows 8), you can only run true web components here, any VB UIs will not run. Initial reviews of Windows 8 are rather mixed, but like MS Vista, it will start appearing on new computers whether you like it or not. With this release we will be both supporting SQL Server 2012 and making SQL Server 2012 available for purchase from Sage. 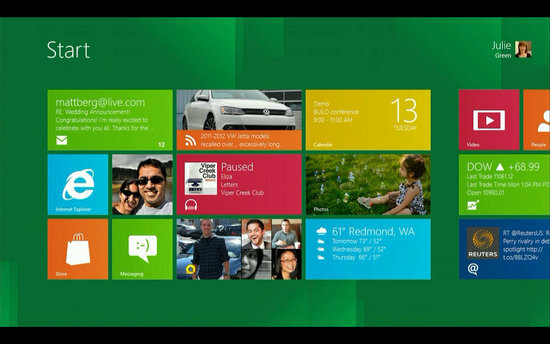 Microsoft provides lots of information on all the new features there. The most obvious one is that the SQL Server Management Studio is now built on the Visual Studio 2012 platform. Besides some color and style changes it appears pretty much the same to me as the previous one, only now it takes much longer to start up. I think the idea is that it then leverages the better developer tools in VS for debugging and such. We now support Pervasive.SQL 11. One notable “feature” of this product is that product licensing and activation are more stringent. You cannot share licenses and your computer must be on-line to validate your activation code. Otherwise checkout out Pervasive’s web site for new features like multi-core support. 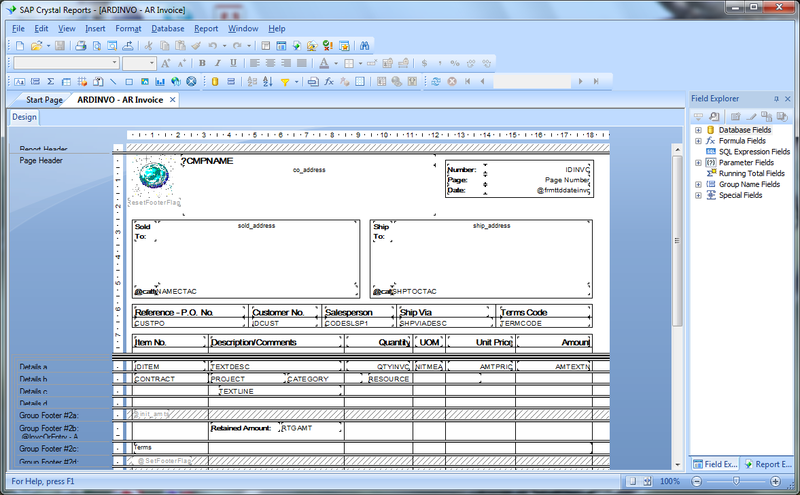 We now fully support designing reports with Crystal Reports 2011. We now bundle the matching runtime for this version of Crystal. Beware that SAP has separated the runtime from the Crystal Reports product, so it is actually called “SAP Crystal Reports runtime engine for .NET Framework 4” (strangely rather than for Crystal Reports 2011). The internal version of the runtime is Version 13. Our current plans are to bundle SP3 of this runtime and its internal version is 13.0.3.612. Since we are just starting regression on the 2012 release, there is some chance that we will end up bundling SP4 if it comes out soon. Generally this upgrade was fairly painless. We did tweak a small number of reports, but these tended to be things that were already wrong. We did find some reports with an incorrect page size, which was ignored by the previous runtime, but now worked and caused problems. Anyway you should try your customized reports and check for alignment issues, especially for things that print on pre-printed forms. Here we support Citrix Xen Apps, VMware ESX 4.1 and ESXi 4.1, and Windows Server 2008 Standard R2 – Hyper V.
Just remember virtualization does add some overhead and if you are running multiple images on one server, beware memory use and CPU contention. For MS Office we support 2003, 2007 and 2010. Note that we only support 32-bit office because of the way our Financial Reporter Excel plug-in works. I didn’t cover everything here; we support Oracle 11gR2 and MS Vista SP2 for instance. But to give you a flavor and some highlights of our upgraded platform support. 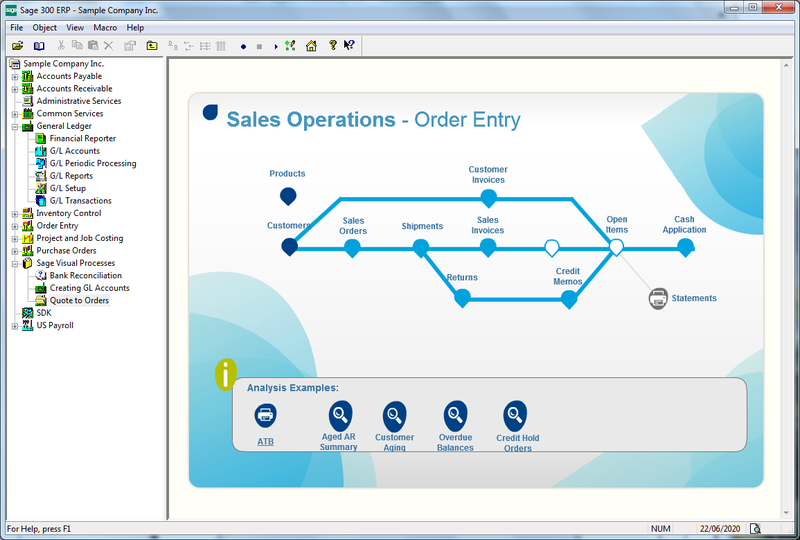 Sage ERP X3 has had a feature called “Visual Process Flows” for some time now. These process flows help users navigate the product to perform their daily tasks. They are fully customizable and you can create these for all the roles in your organization. 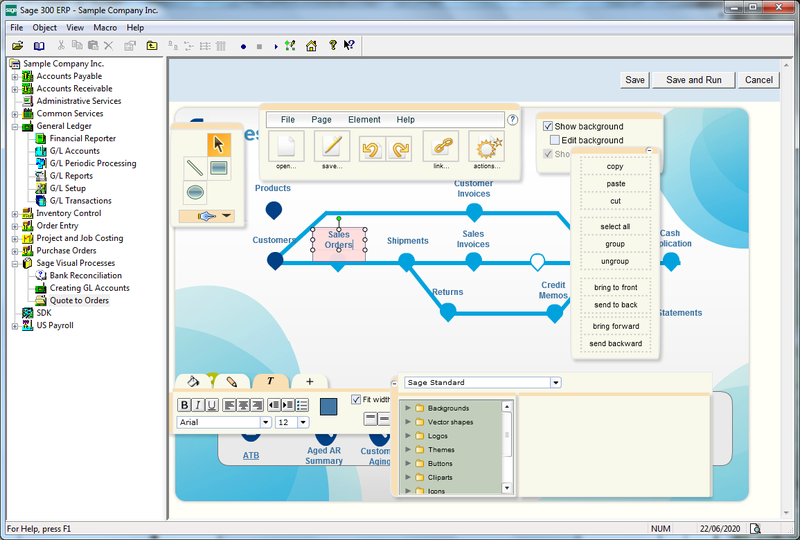 Below is a picture of a process flow in the Sage ERP X3 desktop. However, this visual process flow tool wasn’t just built into the Sage X3 desktop. It was actually developed as a standalone component that could be integrated into any product. Now we are in the process of integrating this into a number of other Sage ERP products starting with Sage 300 ERP 2012. Notice that there is now a “Sage Visual Processes” top level menu item on the Sage 300 Desktop, which contains the list of process flows that have been assigned to a user. To assign flows to users there is an Administrative Services program for this purpose. 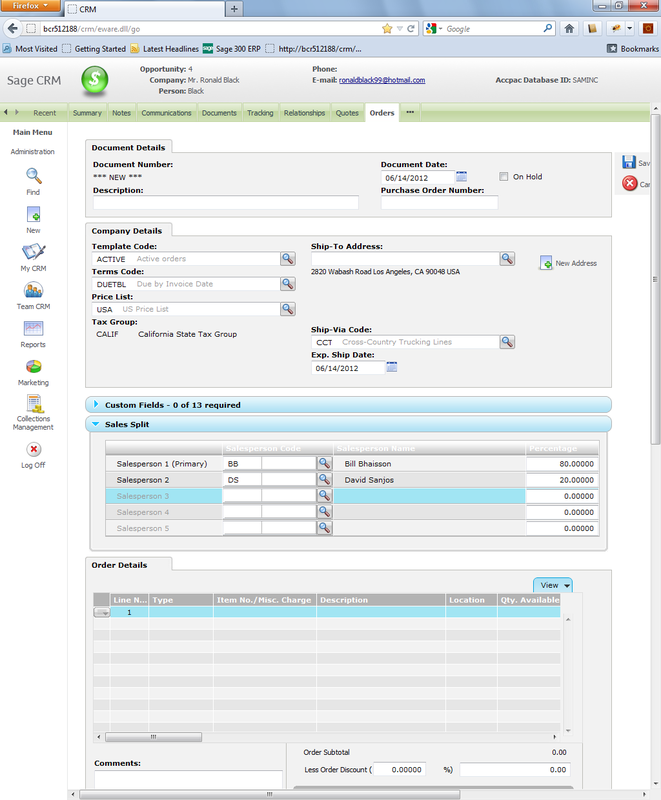 The shown example isn’t complete yet, but when Sage 300 ERP 2012 ships it will include a number of stock process flows. We can then augment this collection as we go along using Sage Advisor Update. If you have the proper security rights, you can right click on the item in the tree and select edit from the context menu to edit the process flow. The Process Flows we ship with go in the program files area as templates, and then any customized one go in a separate area in shared data. This way we can freely update the templates without overwriting customized flows. The primary goal of these Process Flows is to allow users to quickly find their tasks and launch screens without searching through the ERP’s giant tree of icons. Within the Process Flows, it is easy to include much more descriptive text of what needs to get done. 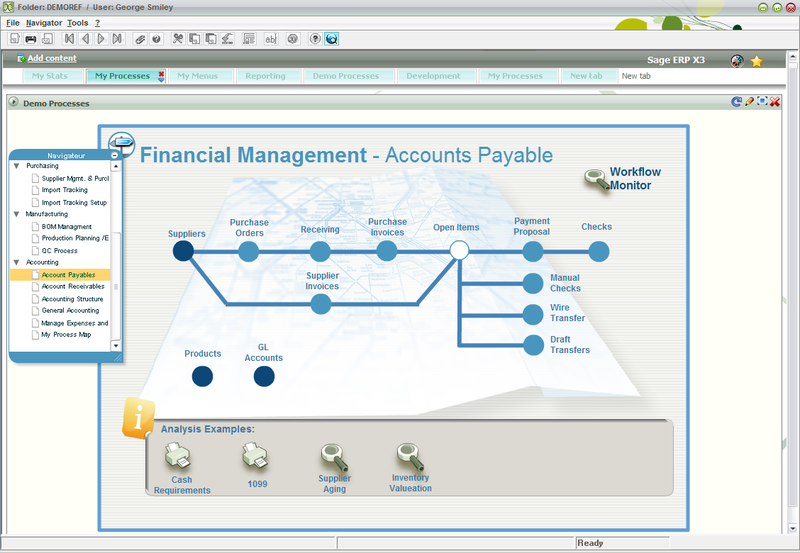 Most small business products like Sage 50 ERP present the user with this model of navigation. However for mid-market ERP, having a number of static hard coded process flows is inadequate. With this tool you can customize Process Flows for all roles that a mid-market customer requires. You have the ability to add your own graphics and to be quite creative in the creation and look of these flows. You could argue that Process Flows doesn’t give you anything new since you are still running the same old screens and after all you can customize the tree of icons to limit what a user sees to run. However from all our usability studies, we find that even with this, users still spend quite a lot of time searching for the correct screen to run, especially ones that they run very infrequently. Plus, I think the Process Flows are quite attractive and more appealing than just displaying a list of icons. You can run one process flow from another, so using these you can construct wizards to step people through longer processes. A great use is to create Process Flow’s for our old setup checklists. Another thing you can do is have a master process flow that drills down into more detailed process flows, creating a more graphical representation of our tree of icons. If you are familiar with Sage ERP X3 and its Process Flows, then you should feel right at home with the tool in Sage 300 ERP. You can even export a process flow from one product and import it into the other, then you just need to change the Sage ERP X3 screen codes to the Sage 300 ERP screen codes (rotoids like OE1100). The actual Process Flows are stored in JSON format, which is a text file format which is easy to deal with. Along the same lines if you have taken the Sage University course on working with Sage ERP X3 Process Flows then you already know how to work with Sage 300 ERP process flows. These are being fitted into the Sage 300 ERP Desktop first, and then later they will be fitted into the Sage 100 ERP and Sage 500 ERP Desktops. Later we will also consider running these from our Sage 300 ERP Web Portal. For that matter we can look at other places to run the Process Flow tool, perhaps as a starting page for tablet applications for instance. I know partners like to charge for what they do, but it would be nice if there was a central place where Process Flows can be freely shared. I wonder if Sage started such a site; would many partners contribute to it? Would customers contribute to it? If there was a lot of contribution it could eventually provide a much larger library of Process Flows than anyone could develop individually. The stone soup approach has worked quite well in other areas, but I know when we tried this with Crystal Reports, it failed quite badly. Still crowd sourcing and open source techniques are a very effective manner to really build critical mass. Sage X3 ERP has over 150 process flows, the other Sage ERPs are starting from scratch but will leverage the X3 work to catch up. Hopefully with community participation we can exceed this by quite a bit. Adding Visual Process Flows to all our products, not only makes them easier to learn and use, but it complements the various branding initiatives to start making all the various Sage ERPs become a family of related products. Plus this feature gives all our desktops a nice visual refresh to make them much more appealing and modern. With each release, besides the big features, we implement a number of common requests that customers have made through our ideas web site. 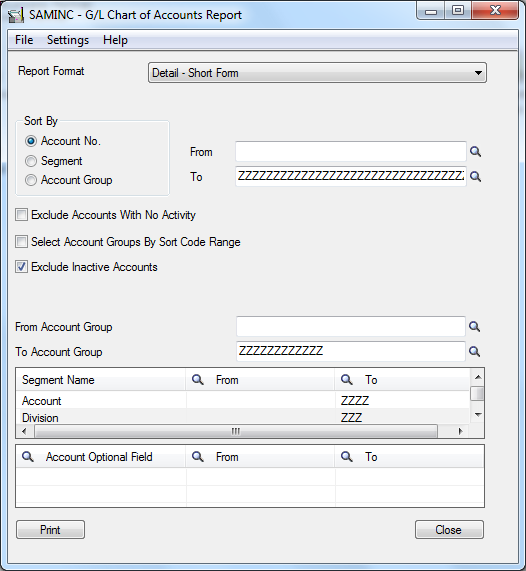 This blog posting covers a number of these that will appear in our forthcoming Sage 300 ERP 2012 release. Many of the items will appear in the Order Entry screen (OE1100). Below is a screen shot where you can find most of the items mentioned for Order Entry. Some tables in Sage 300 ERP are colorful, what about these? Actually the shading is done by taking 95% of the existing color, so the displayed grey is actually 95% of white. In more colorful tables this then gives the same effect in whatever color is being used. On a technical note, this will happen in anything implemented using either a grid or viewlist control. In the Orion project, we added the Entered By field to the database, with the intention of adding the field to the web version of Order Entry and the VB UI. We are not proceeding at this time with the web screen, but we will still include this field on the VB UI. The field will appear in the Header section of the UI, and will not be editable by the user. The field will be added to the header section of the UI (not on the tabs) and will not be editable by the user. The field value will be the user name that first posted the order. If the order is subsequently changed and re-posted, the value in the Entered By field will still show the original user that posted the order. In the Orion project, we added the On Hold Reason field to the database, with the intention of adding the field to the web version of Order Entry and the VB UI. We are not proceeding at this time with the web screen, but we will still include this field on the VB UI. The field will appear in the Header section of the document. The field (250 characters) will be added to the header section of the document. Whether the field is editable is determined by the state of the On Hold field. If the order is On Hold, the On Hold Reason field will be editable. If the order is subsequently taken off hold, the On Hold Reason field will be blanked out and disabled. 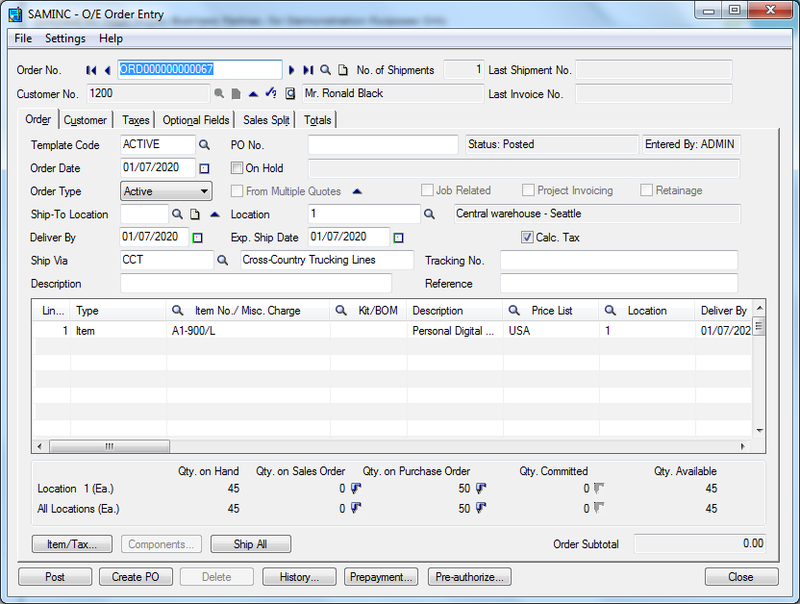 There is a Copy Orders UI in Order Entry that allows user to copy an order or range of orders. Users have requested that we allow the user to copy an order from the main Order Entry screen. So they would have an order open in Order Entry, and want the option to copy that order without having to go to the Copy Orders UI and then enter all of the details of that order for copying. There should be a button at the bottom of Order Entry titled “Copy Order” that launches the Copy Orders UI with the details of the current order already defaulted to the fields on the UI. The user would only be able to do this on a posted order with no pending changes. The user would be able to edit the details of the order on the Copy Orders UI as they would normally be able to do. There is a Create PO’s from OE function in PO (PO5520) that users can use to create POs from OE requirements. The request is that users be able to create the PO’s directly in Order Entry, without having to go into the Create POs from OE UI and manually enter the details of the current order that they have to create POs for. There should be a button at the bottom of Order Entry titled “Create PO” that launches the Create PO’s from OE UI with the details of the current order already defaulted to the fields on the UI. The user would only be able to do this on a posted order with no pending changes. The user would be able to edit the details of the order on the Create PO’s UI as they would normally be able to do. A request has been made to add a “Requested By” date field that would represent the date that the customer wants to have the goods delivered to their door. The field would be on both the header and details of the order, with the default being the same date as the Expected Ship Date. A user would get a warning if they entered a Requested By date that is before the Expected Ship Date. The Requested By date would also be on each detail line (since each detail line can be separately shipped). Move Ship Via Code, Description and Tracking Number fields from the Customer Tab to the Order tab on Order Entry. At TPAC, we received a number of requests from partners that we move the Ship Via Code and its description from the Customer tab on Order Entry to the Order tab. In addition to doing the change to the Ship Via code and description fields, we will bring the Tracking Number field over, too, as they are related fields. In order to make room for this, we are going to move some of the fields around on Order Entry, as well as combine the Entered By (see above) and Source field (this was a suggestion by UCD). Currently, all Chart of Accounts Reports include will include all GL Accounts in the selected range, whether they are active or flagged as Inactive in GL. The request is that we add an option to the GL Chart of Accounts UI (GL4101) to allow users to exclude accounts that are flagged in GL as Inactive. By default, the reports will still print all accounts, but if the user selects to exclude inactive accounts, only Active accounts will be shown on the reports. There will be a checkbox added to the UI (GL4101), and the reports (Detail – Short/Long Form, Valid Currencies, Allocation, Control Account Subledgers, Fiscal Set Comparison, and Rollup Accounts) will need to be changed to accept the new parameter and print the parameter (if selected) at the top of the report. Currently, the GL Transactions Listing Report (GL4103) allows users to select only one fiscal year, but a range of fiscal periods, as parameters on the report. The request is to allow users to select a range of both years and periods for the report. The selectors for the year and periods on GL 4103 will be changed to Year/Period pickers to allow a From and To date range to include both the year and period. The Report will also be changed to accept the parameter and print the parameters at the top of the report. Update 2012/06/26: It looks like this feature didn’t make code complete, so its being moved to Product Update 1. The Customer Inquiry feature in Accounts Receivable allows users to view details of customer transactions, from both OE and AR. Currently, the user can only print documents from AR from Customer/Document Inquiry, although the user is able to drill down to the OE documents. The request is that the user be able to print an OE Invoice from Customer/Document Inquiry without having to go to OE first. There are several ways we could implement this. We could enable the user to drill down to the OE Invoice from Customer and/or Document Inquiry, and then enable printing of the invoice from the OE Invoice Entry UI (OE1900), OR we could place a button on the document inquiry UI allowing the user to print the OE Invoice (which would launch the OE Invoices form from that UI). Currently, a user can reverse a single entry. There are multiple requests to allow users to reverse an entire batch. We will change the Create Reverse Entry UI to allow users to optionally reverse an entire batch, or just a single entry. 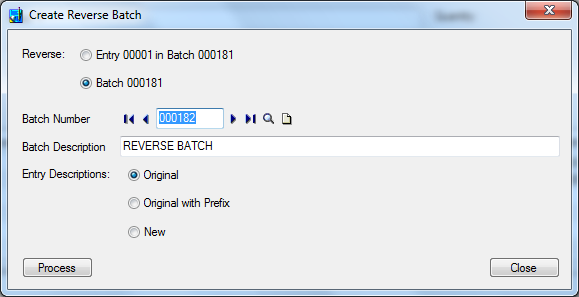 They will be able to customize the Entry Descriptions that will be used in the new reverse batch. Pretty apparent, not much else to say. These are just to show the smaller features that are often lost among the bigger items that are included in our releases. • There will not be a Copy Order button on OE1100. Instead, it will be an option on the file menu labeled “Copy Current Order”. • The “Requested By” field will actually be labelled “Deliver By”.